Britain's Chris Froome has won the week-long Criterium du Dauphine stage race, emulating Sir Bradley Wiggins, who triumphed in 2011 and 2012. 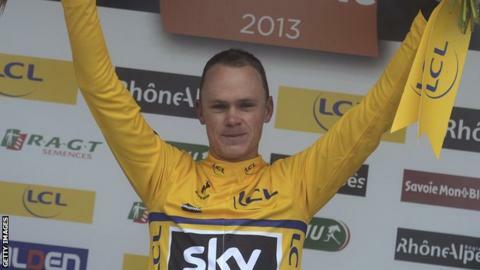 Team Sky's Froome, 28, finished second on the final stage in the French Alps, behind Italy's Alessandro De Marchi. Froome beat team-mate Richie Porte by 58 seconds in the overall standings. "It's a positive test for the Tour de France," he said. "I'll do everything to win it as well. We've good reason to be confident with such a great team." The Dauphine is a good indicator of a rider's form heading into the Tour, which starts on 29 June, and Froome will now hope to emulate Wiggins, who followed his Dauphine triumph 12 months ago by becoming the first British Tour de France winner. However, the Kenyan-born Brit insists he is just one of several contenders for the yellow jersey. "I have won the Dauphine, and other races before, but the counter is back to zero when the Tour starts," he said. "There will be six to seven main contenders for overall victory. The names? [Alberto] Contador, [Alejandro] Valverde, [Joaquim] Rodriguez, [Cadel] Evans, [Tejay] Van Garderen and [Nairo] Quintana are all capable of strong rides." In May, Team Sky confirmed Froome would lead their challenge at the Tour de France ahead of team-mate Wiggins, who has since been ruled out of defending his title in the three-week race because illness and injury have left him insufficient time to train for it. Froome's victory continues a highly successful year for the rider, who is regarded as one of the favourites for this year's Tour after finishing second last year. His Dauphine victory follows successes at the Tour of Oman,Criterium International and Tour de Romandie. "It's been a dream scenario," Froome added. "To come away with the victory plus one of my best friends and team-mate Porte in second place overall, I couldn't ask for more. "Tonight I'll be able to have a drink with my team-mates to celebrate this great win. In the coming days, we'll go and recognise some mountain stages of the Tour." On Sunday, the first significant rain of the eight-stage race made conditions treacherous during parts of the 155.5-kilometre run from Sisteron to Risoul. That caused several riders to withdraw for precautionary reasons with fewer than three weeks to go to the Tour de France, which starts in Corsica. But there was no let up from Froome, who charged out of the peloton late in the stage with Porte on his wheel to try and catch De Marchi, the lone survivor of a breakaway, home. Froome looked to be trying to set Porte up for the stage win but the Australian was unable to up his pace enough and when Garmin rider Andrew Talansky suddenly emerged from the mist to threaten second place, Froome was forced to sprint for the line. Alberto Contador, who is expected to be one of Froome's main rivals at the Tour de France, crashed with around 26km of the stage remaining. The Spaniard was quickly back on his bike though and rejoined the yellow jersey group before attacking 5.5km from the finish. However, with his Saxo-Tinkoff team-mate Michael Rogers, who started the final stage in third place overall, struggling on the final ascent, Contador dropped back to offer his support. Despite Contador's help, Rogers slipped further back and finished almost two minutes behind De Marchi to drop to sixth overall, with Spain's Daniel Moreno moving up to third. 1. Alessandro De Marchi (Ita/Cannondale) 4:28'09"
2. Chris Froome (GB/Team Sky) +24"
4. Richie Porte (Aus/Team Sky) +31"
5. Jakob Fuglsang (Den/Astana) +38"
1. Chris Froome (GB/Team Sky) 29:28'46"
2. Richie Porte (Aus/Team Sky) +58"
3. Daniel Moreno (Spa/Katusha) +2'12"
4. Jakob Fuglsang (Den/Astana) +2'18"
5. Daniel Navarro (Spa/Cofidis) +2'20"
10. Alberto Contador (Spa/Saxo - Tinkoff) +4'27"
15. Geraint Thomas (GB/Team Sky) +9'02"
23. Peter Kennaugh (GB/Team Sky) +17'35"